Lung cancer is the leading cause of cancer mortality in the United States and is associated with a five-year-survival of 17%. However, only 15% of patients are diagnosed at an early stage.1 The announcement of the National Lung Screening Trial (NLST) results in 2010 and their subsequent publication was a defining moment in the lengthy quest to determine the value of low-dose CT (LDCT) lung cancer screen ing. For the first time, a mortality benefit was demonstrated for this technique in a large randomized trial.2 A direct outgrowth of this study was a favorable recommendation for CT-based lung cancer screening by several prestigious organizations. In 2013, the United States Preventive Services Task Force (USPSTF), a group whose recommendations are frequently adopted by Medicare and other carriers, has lent support to low-dose CT screening for lung cancer.3 More recently, the Centers for Medicare and Medicaid Services (CMS), recommended CT screening for adults 55-77 years of age with an appropriate history of smoking.4 Notwithstanding these favorable events, CT screening for lung cancer remains a complex and multifaceted issue, and it is appropriate to review considerations that favor screening and those that may be cause for hesitation. Lung cancer mortality in the United States is overwhelmingly due to behavioral factors, namely smoking with constitutional predispositions playing a lesser role.3 Because it is fairly straightforward to identify a group of patients at risk and due to lung cancer’s high mortality, screening for early lung cancer has considerable appeal. Screening with chest radiography and sputum cytology has been evaluated without proof of effectiveness, whereas LDCT has generated substantially greater expectations (Figures 1 and 2). Lung cancer screening with LDCT has been the subject of a variety of research methods and the focus of considerable controversy. Most debates have centered on its sensitivity in detecting lung cancer, its false-positive rate and the possibility of complications from invasive follow-up, its use of ionizing radiation and its cost. Some of these studies, most notably the ELCAP (Early Lung Cancer Action Program) trials, were crucial in suggesting the potential of LDCT lung cancer screening and defining the framework for such studies. The multicenter international ELCAP trial, consisting of 31,567 patients, showed a high prevalence of early lung cancer detection (85%) and associated long-term survival.5 A disadvantage of these earlier studies was the lack of a formal control group which created difficulty in establishing a mortality benefit for screening. The NLST was designed to overcome this drawback with a sufficiently large patient cohort and a randomized study design. The rigorous methodology and large size of the NLST set it apart from most prior randomized studies, which have had inconclusive or conflicting results. This methodology has been reviewed and largely accepted by the medical community, and has given rise to a series of corollary studies. One area of particular interest has been whether to broaden the restrictive enrollment criteria (55- to 74-year-old smokers and nonsmokers with a smoking history of 30 pack-years or greater) and how to make screening more accessible outside of large urban subspecialty medical centers. The focus on large academic centers likely contributed to the power of LDCT to detect early lung cancer and the minimization of risks of invasive follow up. With respect to the behavioral effects of screening upon smokers, the “educational opportunity” provided in communicating a scan result, whether negative or indeterminate, is the subject of past and present research and outcomes modeling.6 One study showed that 14% of smokers had quit (twice the expected rate of the general population) 1 year after LDCT screening while another study demonstrated that abstinence rates increased from 20% to 24%, 28% and 42%, respectively, if smokers received 0, 1, 2 or 3 abnormal scan reports over a 3 year period.7,8 In one modeling analysis based on historical data comparing the benefits of lung cancer screening and smoking cessation, smoking cessation would have resulted in a mortality reduction more than twice that of LDCT lung cancer screening.9 Documentation of efforts to promote smoking cessation is an important component of the recent CMS NCD. Quality of life has also been studied with respect to patients’ experiences of screening in the NELSON trial. Health-related quality of life (HRQoL) and anxiety was not impacted over time. In a separate study, lung-cancer-specific distress increased after an indeterminate or suspicious result and significantly decreased after a negative result.10 In summary, smoking behavior may be favorably altered after LDCT screening without an adverse effect on quality of life. Further research is likely to be aimed at decreasing the subjectivity of smoking cessation and quality of life parameters to refine interventions. 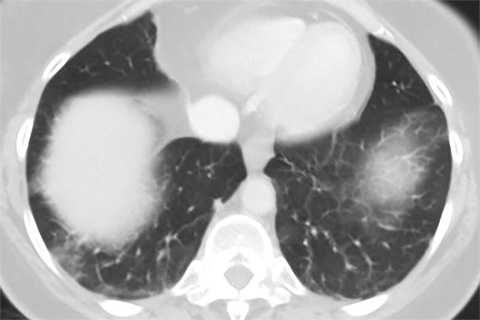 The benefits of CT-based lung cancer screening are accompanied by several drawbacks. Some of the limitations are related to the heavy reliance of evidence from the NLST. Other unanswered questions relate to the false positive results, cost-effectiveness and concerns about radiation exposure. Nearly all of the current favorable conclusions and recommendations regarding lung cancer screening with LDCT are based on the NLST results. While the NLST is regarded as a large and well-designed study, no other randomized trial to date has replicated its results. Several smaller randomized studies, including the Detection and Screening of Early Lung Cancer by Novel Imaging Technology and Molecular Essays (DANTE) published in 2009 and Danish Lung Cancer Screening Trial (DLCST) published in 2012, showed no difference in lung cancer mortality between the LDCT and the control groups.13,14 It would be optimal to confirm screening efficacy with a second large randomized trial. Such confirmation may be provided by the NELSON trial, which is scheduled for completion within the next one to two years. Potential screening centers need to consider the technical and medical expertise available to the NLST screening sites. The 20% mortality benefit from the screening trial was achieved largely at university medical centers with high-throughput and experienced physicians in multiple disciplines: radiologists, pulmonologists, and thoracic surgeons skilled at the diagnosis, management, and operative treatment of lung cancer.2 The NCD by CMS outlines several important criteria for reimbursement including shared decision-making and discussion of smoking cessation or continued abstinence with the patient, radiologist and imaging center eligibility criteria and participation in a CMS approved registry such as that recently developed by the American College of Radiolgy (ACR).4 Optimization of lung cancer screening will surely involve dedicated specialists working with a multidisciplinary approach as well as comprehensive ancillary medical support such as screening coordinators. It is unclear whether a mortality advantage similar to that of the NLST can be routinely achieved in a community setting. False-positive results accounted for 96.4% of positive cases in the LDCT group over 3 rounds of screening in the NLST. In total, 24.2% of patients screened with CT had a positive result. While the bulk of false-positive findings were resolved based on follow-up studies, a non-trivial number of cases required invasive diagnostic evaluation. Among patients in the NLST with positive screening results on LDCT, 2.2% underwent percutaneous biopsy, 4.3% underwent bronchoscopy, and 4.2% underwent a diagnostic surgical procedure.15 Major complications from invasive diagnostic evaluation were infrequent, occurring in 11.6% of patients in the LDCT group of NLST who under went such procedures.2 False-positive results can potentially be minimized by the use of additional imaging modalities and sputum- or blood-based markers, and research efforts are ongoing to define the role of these approaches in screening. Screening programs with LDCT should ideally demonstrate cost-effectiveness prior to widespread use. It is estimated that implementation of the USPSTF recommendations by Medicare and other carriers would lead to a rapid increase in healthcare utilization with eligibility of 94 million smokers and ex-smokers in the United States. The upfront cost of annual LDCT is about $300 (based on the Medicare reimbursement benchmark) per screened individual, whereas the downstream costs related to diagnostic workup and treatment are more substantial. A recent report based on NLST data estimated that LDCT screening for lung cancer would cost $81,000 per quality of adjusted life years (QALY) gained (QALY< $100,000 is generally considered cost-effective) but the authors noted slight differences in the way screening is implemented might substantially alter this number.18 Another public health goal is to ensure availability of screening across all socioeconomic groups. Quality of life data from the NLST are pending and will provide further insight into the economics of lung cancer screening. Another aspect of cost is the expense related to organization and maintenance of a LDCT lung screening program. As noted, this will require adherence to the new CMS guidelines and integration of the efforts of multiple specialists who will provide care the subject during the course of screening and its aftermath. The business plan also must include the cost of hiring an individual who will oversee and coordinate the entire process. Additional expenditures may be incurred in marketing such a program. The linear no-threshold model proposes that a carcinogenic risk of ionizing radiation exists even at low diagnostic doses. LDCT carries an estimated effective dose of 1.5 mSv, compared to annual background radiation exposure of 2.4 mSv in the US and a mean effective dose of 0.052 mSv from a PA chest radiograph in the NLST.19 On average, NLST participants received 8 mSv over 3 years accounting for both screening and additional downstream testing.20 One estimate stated that a female smoker who undergoes annual screening from 50 to 75 years of age would encounter a 0.85% increase in lung cancer risk from the radiation exposure.21 Referring physicians should be cautioned that younger patients with a longer lifetime risk for radiation-induced cancer may not benefit as much from screening. Strategies such as the use of iterative reconstruction technology to reduce radiation exposure should be employed in addition to adherence to appropriate standards for LDCT screening. Even with the finding of a mortality advantage in the NLST, the potential for overdiagnosis (disproportionately greater diagnosis of indolent or non-life threatening cancer by screening) of lung cancer exists. Patz et al observed that 18% of lung cancers identified in the NLST were indolent and might reflect overdiagnosis.22 In addition, it is conceivable that a negative LDCT screening result might provide false reassurance that lung cancer is absent in individuals where it is later found. 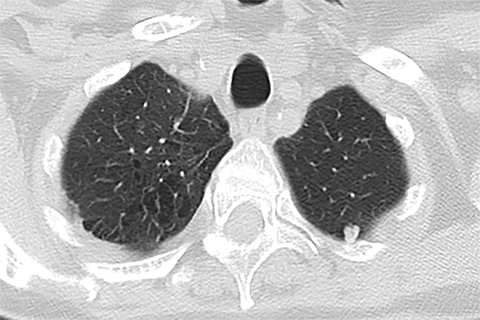 Small central nodules and airway lesions are difficult to detect on LDCT. The publication of the NLST and subsequent favorable recommendations by the USPSTF and CMS are appropriately viewed as encouraging developments. The implementation of the CMS NCD is evolving and such issues as the final status of CMS-approved registries, coding and reimbursement remain to be elucidated. The new ACR lung-RADS classification shows promise but has yet to be applied widely in clinical practice. As further advances in CT technology occur, it will be vital to optimize acquisition parameters while minimizing radiation dose and determining the proper role for ancillary technologies such as computer-aided detection. Assuming there are no contradictory data or other unforeseen issues that call into question the results of the NLST, it will be important to further define the ideal patient for lung cancer screening and refine the management algorithm that follows screening. Most critically, it will be imperative to educate both physicians and potential subjects as to best practices in LDCT lung screening. Humphrey L, Deffebach M, Pappas M, et al. Screening for lung cancer: Systematic review to update the US Preventive Services Task Force Recommendation. Rockville (MD). 2013. National Lung Screening Trial Research T, Aberle DR, Adams AM, et al. Reduced lung-cancer mortality with low-dose computed tomographic screening. NEJM New Engl J Med. 2011;365:395-409. Humphrey LL, Deffebach M, Pappas M, et al. Screening for lung cancer with low-dose computed tomography: A systematic review to update the US Preventive services task force recommendation. Ann intern med. 2013;159:411-420.
International Early Lung Cancer Action Program I, Henschke CI, Yankelevitz DF, et al. 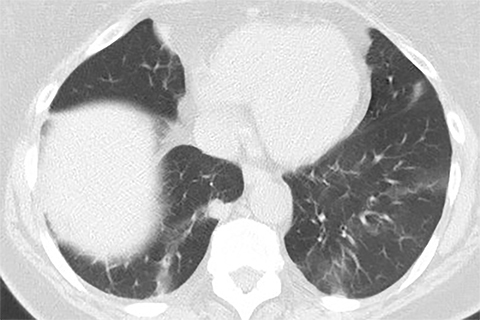 Survival of patients with stage I lung cancer detected on CT screening. NEJM New Engl J Med. 2006;355:1763-1771. Cox LS, Clark MM, Jett JR, et al. Change in smoking status after spiral chest computed tomography scan screening. Cancer. 2003;98:2495-2501. Townsend CO, Clark MM, Jett JR, et al. Relation between smoking cessation and receiving results from three annual spiral chest computed tomography scans for lung carcinoma screening. Cancer. 2005;103:2154-2162. McMahon PM, Kong CY, Johnson BE, et al. Chapter 9: The MGH-HMS lung cancer policy model: tobacco control versus screening. Risk analysis. 2012;32 Suppl 1:S117-124. van den Bergh KA, Essink-Bot ML, Borsboom GJ, et al. Short-term health-related quality of life consequences in a lung cancer CT screening trial (NELSON). Brit J Cancer. 2010;102:27-34. Mets OM, Vliegenthart R, Gondrie MJ, et al. Lung cancer screening CT-based prediction of cardiovascular events. JACC Cardiovascular imaging. 2013;6:899-907. Pastorino U. Current status of lung cancer screening. Thoracic surgery clinics. 2013;23:129-140. Infante M, Cavuto S, Lutman FR, et al. A randomized study of lung cancer screening with spiral computed tomography: three-year results from the DANTE trial. Am J Resp Crit Care Med. 2009;180:445-453. Saghir Z, Dirksen A, Ashraf H, et al. CT screening for lung cancer brings forward early disease. The randomised Danish Lung Cancer Screening Trial: status after five annual screening rounds with low-dose CT. Thorax. 2012;67:296-301. National Lung Screening Trial Research T, Church TR, Black WC, et al. Results of initial low-dose computed tomographic screening for lung cancer. NEJM New Engl J Med. 2013;368:1980-91. Pinsky PF, Gierada DS, Black W, et al. Performance of lung-RADS in the National Lung Screening Trial: A retrospective assessment. Ann intern med. 2015. Black WC, Gareen IF, Soneji SS, et al. Cost-effectiveness of CT screening in the National Lung Screening Trial. NEJM New Engl J Med. 2014;371:1793-1802. Kruger R, Flynn MJ, Judy PF, Cagnon CH, Seibert JA. Effective dose assessment for participants in the National Lung Screening Trial undergoing posteroanterior chest radiographic examinations. AJR Am J Roentgenol. 2013;201:142-146. Bach PB, Mirkin JN, Oliver TK, et al. Benefits and harms of CT screening for lung cancer: A systematic review. JAMA. 2012;307:2418-2429. Brenner DJ. Radiation risks potentially associated with low-dose CT screening of adult smokers for lung cancer. Radiology. 2004;231:440-445. Patz EF, Jr., Pinsky P, Gatsonis C, et al. 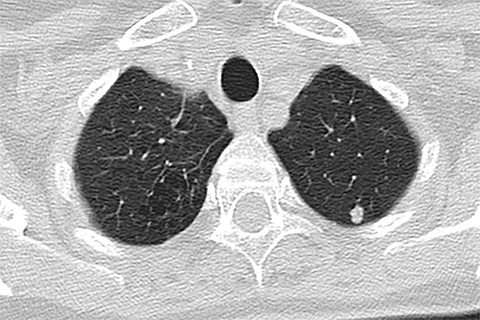 Overdiagnosis in low-dose computed tomography screening for lung cancer. JAMA intern med. 2014;174:269-274. Lung cancer screening: Pros and cons. Appl Radiol. Dr. Terpenning, Dr. Lin and Dr. White are with the Department of Diagnostic Radiology and Nuclear Medicine, University of Maryland School of Medicine, Baltimore, MD. Dr. White is a member of the Applied Radiology Editorial Advisory Board.